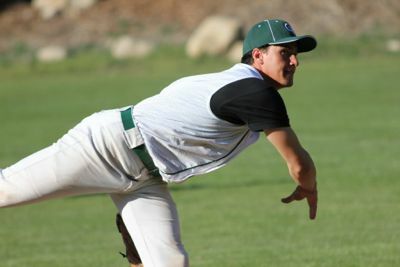 Ojai Valley School’s sports teams hit the trifecta Wednesday, as the baseball, lacrosse and golf teams all scored victories in sporting contests. The Spuds’ baseball team opened its season with a strong showing against Maricopa on Wednesday, winning the opener by a score of 23-3. Senior Miles Munding-Becker had an exceptional day swinging the bat, recording two hits, including an inside-the-park grand slam. Junior Min Choi and sophomore Connor Floyd also recorded four RBIs each. Junior Cameron Cuthbert started the game on the mound, striking out six batters through three innings. Miles relieved Cameron after the third inning, and threw five strikeouts in 1.2 innings. 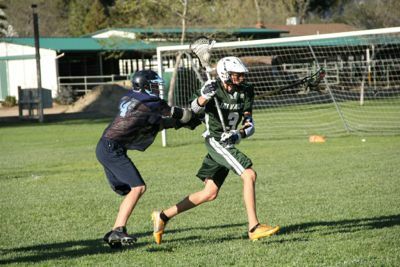 In lacrosse, the Upper Campus team won its first game of the season Wednesday, pulling out a tough overtime victory against rival Laguna Blanca with a score of 9-8. 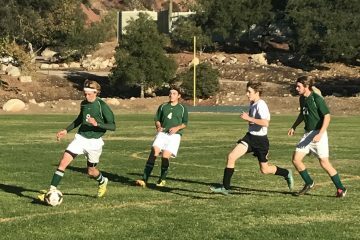 After a fierce battle during regulation, the game ended when junior Grant Spencer took a pass from sophomore Garrett Schreiner, dodged to the outside and whipped the ball into the corner of the net for the decisive goal . 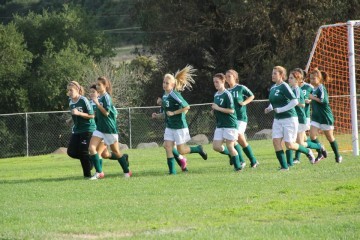 The victory, at the Lower Campus, evens OVS’ record of 1-1 on the season. First-year player Nick Giannetti, playing in only his second game, scored the first two goals of his career against Laguna. The first goal involved luck and the breaking of the laws of physics. For the second goal after receiving a pass from a teammate Nick skillfully shot a goal over a defender’s head and into the goal. “The second goal had a real sense of accomplishment, I felt like I did something to help the team,” said Nick. The game however was all but easy. Laguna was even able to successfully tie the game. The Spuds play against Midland at home at 2 p.m at the Lower Campus. On the golf course, freshman Davis Smith shot one over par to lead the Spuds to victory over the Earwigs (Dunn School).